Anderson P, Caligiuri M, O'Brien C, et al. (1990). "Fc gamma receptor type III (CD16) is included in the zeta NK receptor complex expressed by human natural killer cells". Proc. Natl. Acad. Sci. U.S.A. 87 (6): 2274–8. doi:10.1073/pnas.87.6.2274. PMC 53669 . PMID 2138330. Ory PA, Clark MR, Kwoh EE, et al. (1989). "Sequences of complementary DNAs that encode the NA1 and NA2 forms of Fc receptor III on human neutrophils". J. Clin. Invest. 84 (5): 1688–91. doi:10.1172/JCI114350. PMC 304039 . PMID 2478590. Peltz GA, Grundy HO, Lebo RV, et al. (1989). "Human Fc gamma RIII: cloning, expression, and identification of the chromosomal locus of two Fc receptors for IgG". Proc. Natl. Acad. Sci. U.S.A. 86 (3): 1013–7. doi:10.1073/pnas.86.3.1013. PMC 286611 . PMID 2521732. Scallon BJ, Scigliano E, Freedman VH, et al. (1989). "A human immunoglobulin G receptor exists in both polypeptide-anchored and phosphatidylinositol-glycan-anchored forms". Proc. Natl. Acad. Sci. U.S.A. 86 (13): 5079–83. doi:10.1073/pnas.86.13.5079. PMC 297560 . PMID 2525780. Ravetch JV, Perussia B (1989). "Alternative membrane forms of Fc gamma RIII(CD16) on human natural killer cells and neutrophils. Cell type-specific expression of two genes that differ in single nucleotide substitutions". J. Exp. Med. 170 (2): 481–97. doi:10.1084/jem.170.2.481. PMC 2189395 . PMID 2526846. Simmons D, Seed B (1988). "The Fc gamma receptor of natural killer cells is a phospholipid-linked membrane protein". Nature. 333 (6173): 568–70. doi:10.1038/333568a0. PMID 2967436. Indik ZK, Hunter S, Huang MM, et al. (1994). "The high affinity Fc gamma receptor (CD64) induces phagocytosis in the absence of its cytoplasmic domain: the gamma subunit of Fc gamma RIIIA imparts phagocytic function to Fc gamma RI". Exp. Hematol. 22 (7): 599–606. PMID 7516890. Detmers PA, Zhou D, Powell D, et al. (1995). "Endotoxin receptors (CD14) are found with CD16 (Fc gamma RIII) in an intracellular compartment of neutrophils that contains alkaline phosphatase". J. Immunol. 155 (4): 2085–95. PMID 7543538. Morcos M, Hänsch GM, Schönermark M, et al. (1995). "Human glomerular mesangial cells express CD16 and may be stimulated via this receptor". Kidney Int. 46 (6): 1627–34. doi:10.1038/ki.1994.462. PMID 7700021. Schumann G, Dasgupta JD (1995). "Specificity of signal transduction through CD16, TCR-CD3 and BCR receptor chains containing the tyrosine-associated activation motif". Int. Immunol. 6 (9): 1383–92. doi:10.1093/intimm/6.9.1383. PMID 7819147. Gessner JE, Grussenmeyer T, Kolanus W, Schmidt RE (1995). 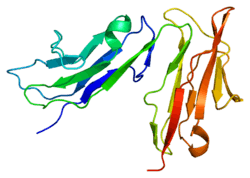 "The human low affinity immunoglobulin G Fc receptor III-A and III-B genes. Molecular characterization of the promoter regions". J. Biol. Chem. 270 (3): 1350–61. doi:10.1074/jbc.270.3.1350. PMID 7836402. Altin JG, Pagler EB, Kinnear BF, Warren HS (1994). "Molecular associations involving CD16, CD45 and zeta and gamma chains on human natural killer cells". Immunol. Cell Biol. 72 (1): 87–96. doi:10.1038/icb.1994.13. PMID 8157290. Pignata C, Prasad KV, Robertson MJ, et al. (1994). "Fc gamma RIIIA-mediated signaling involves src-family lck in human natural killer cells". J. Immunol. 151 (12): 6794–800. PMID 8258691. Cone JC, Lu Y, Trevillyan JM, et al. (1993). "Association of the p56lck protein tyrosine kinase with the Fc gamma RIIIA/CD16 complex in human natural killer cells". Eur. J. Immunol. 23 (10): 2488–97. doi:10.1002/eji.1830231017. PMID 8405050.
de Haas M, Koene HR, Kleijer M, et al. (1996). "A triallelic Fc gamma receptor type IIIA polymorphism influences the binding of human IgG by NK cell Fc gamma RIIIa". J. Immunol. 156 (8): 3948–55. PMID 8609432. Gessner JE, Grussenmeyer T, Dumbsky M, Schmidt RE (1997). "Separate promoters from proximal and medial control regions contribute to the natural killer cell-specific transcription of the human FcgammaRIII-A (CD16-A) receptor gene". J. Biol. Chem. 271 (48): 30755–64. doi:10.1074/jbc.271.48.30755. PMID 8940055. Koene HR, Kleijer M, Algra J, et al. (1997). "Fc gammaRIIIa-158V/F polymorphism influences the binding of IgG by natural killer cell Fc gammaRIIIa, independently of the Fc gammaRIIIa-48L/R/H phenotype". Blood. 90 (3): 1109–14. PMID 9242542. Nourse, JP (Jan 2012). "The KIR2DS2/DL2 genotype is associated with adult persistent/chronic and relapsed immune thrombocytopenia independently of FCGR3a-158 polymorphisms.". Blood Coagul Fibrinolysis. 23 (1): 45–50. doi:10.1097/mbc.0b013e32834d7ce3. PMID 22024796. Keane, C (Oct 2012). "Homozygous FCGR3A-158V alleles predispose to late onset neutropenia after CHOP-R for Diffuse Large B-cell Lymphoma.". Internal Medicine. 42 (10): 1113–9. doi:10.1111/j.1445-5994.2011.02587.x. PMID 21883784.